Explore New Zealand's South Island with its unique 8 unique geographical regions and diverse natural beauty, from soaring mountain peaks of the Southern Alps, fiords, glaciers, lakes, rivers, native alpine bush and the southern skifields by bus and coach from Greymouth. Together with the networks of InterCity Coachlines, Great Sights, Newmans Coachlines and Mana/Naked Bus, you can travel to over 300 destinations and key tourist attractions in the South Island with over 70 services every day. With fares starting from NZ$1.00, travelling on InterCity Coachlines, Newmans Coachlines, Great Sights and Mana/Naked Bus bus coach networks is an affordable way to see the South Island's unique scenic beauty. Major coach and bus operators like Mana/Naked Bus and InterCity Coachlines provide frequent daily regional services through out the South Island. There are many smaller bus and shuttle companies, that offer frequent daily bus services within local or regional areas in the South Island. Travel is in modern buses and coaches with InterCity Coachlines operating a fleet of eco-friendly, air conditioned buses with reclining seats, foot rests and heat rests. Great Sights operates premier scenic sightseeing services using a fleet of modern eco-friendly air conditioned coaches with reclining seats and head rests and onboard toilet/washroom facilities. 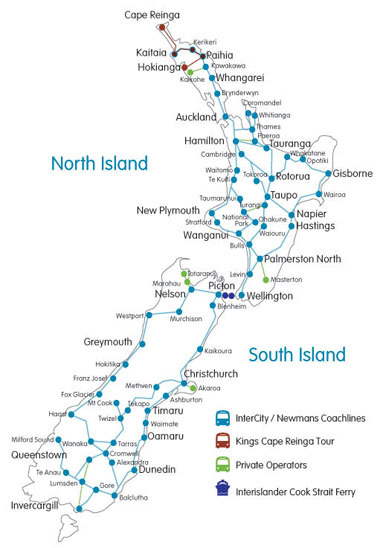 Larger coach and bus operators operate frequent daily bus and coach services in both the North and South Island, with some services that connect with ferry services that operate between the North and South Islands. If you want to explore and see New Zealand's unique scenic beauty, there is a range of 'Book As You Go' bus and coach passes that provides value for money travel.